The first lesson that a teacher gives in introducing the story of humankind’s past is that “History repeats itself.” Throughout the course, whether U.S. history, European, Asian, African or what-have-you, this slogan, if you will, will pop up in quite a few lessons. And why not? People are from different countries, with various cultures, but wherever you may be, what is happening to you right now has occurred to people last year a decade ago, and centuries past. Conquests take place, occupation soldiers solidify their rule. Economics goes boom and go bust. The cycle of life assures us that whatever Mr. Trump does now has been done by presidents in the past. OK maybe that’s an exception. Now Christian Petzold gives us a film that has us visualize such a cycle. He has stated that he could have made a movie set in Europe in 1942 but chooses to make the occupation, the anxieties of the people trying to escape, the brutality of the conquering regime, all the stuff that took place with a vengeance in the early forties in Europe is occurring today. Does ISIS ring a bell? The Syrian Civil War that has caused hundreds of thousands to flee to refuges willing to accept them? The characters are in good hands with Christian Petzold in the director’s chair, since in 2014 his film “Phoenix,” about a disfigured Holocaust survivor, a Jewish woman eager to discover whether her husband betrayed her hiding place during the German occupation, gets vengeance in the final two or three minutes. Those moments are a gem, a classic, inflicting harm on the weasel without having even to touch him. Now, as in “Phoenix,” Petzold deals with life, with death, and with the ghosts that flow between these two extremes. Petzold, then, takes the chaos in Europe during the early forties, transposes it to the near future, and shows how the Nazi “cleansing” then is leading to a similar fate now, as many in population are desperate to escape to Mexico, to Spain, to the U.S. and anywhere else that is far away from the front. It’s a doozy of a picture. Petzold’s central character, Georg (Franz Rogowski), is a German refugee fleeing from the ongoing troops occupying one French city after another. He has no papers but as luck would have it he has picked up the identity of a novelist, Weidel, who has committed suicide in his fleebag hotel, leaving the bathtub flooded with his blood. He uses the papers to negotiate with the Mexican consul in Marseilles, where only those who can prove that they’re on their way out of the country are allowed to stay in the hotels. He—in transit, so to speak, between the old world and the current one–seeks what else? A transit visa. Then, complications. The wife of the novelist feels guilty that she left him and is now taken with refugee Richard (Godehard Giese), a doctor. In fact every refugee has a story to tell, slim parts of which Georg hears while waiting on line in a consulate. Further complicating the plot, Georg becomes fond of a boy named Driss (Lilien Batman) with whom he plays a quick pickup game of soccer. Getting back to our theme of history’s repeating itself, the looks of Marseilles are such that had we not known when the action takes place, we would not be able to figure the year. Presumably if a Burger King appeared in the set, takes would wind up on the floor. 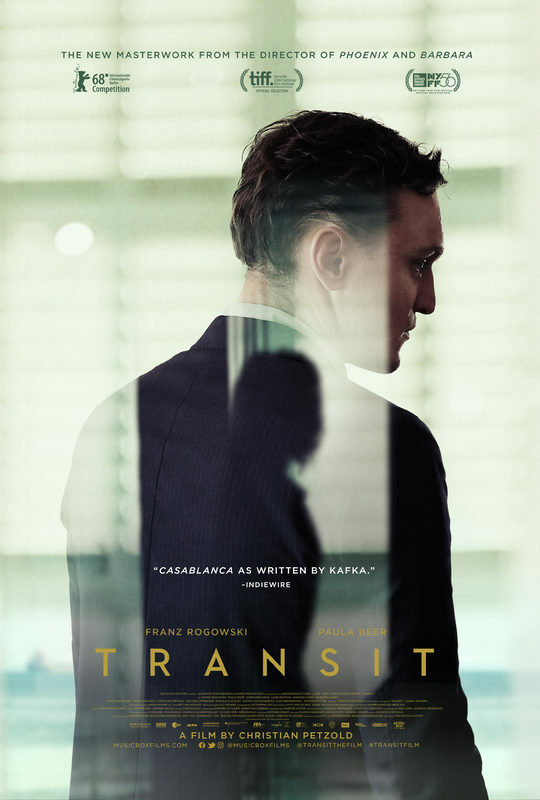 “Transit” is adapted from the novel by Anna Seghers (1900-1983) published in 1942 and now reprinted in English. The book is from the hands of a woman born into an upper-class Jewish family in Mainz, Germany, who fled (surprise!) from Marseilles to Mexico to escape the Nazis. Director Petzold, who notes that the Nazis destroyed German culture with its propaganda, herein uses the character of Georg to assert the fate of the refugee, always moving around, rootless and lonely until he meets the woman he loves since with the novelist’s identity he has become as centered as one can be in his situation. The film, which is in German and French with English subtitles, is one of those works that reward viewers who have the patience to allow the different fragments of the story to become solidified. Did I say reward? Yes I did.